This week, I decided to have a look for any articles about my 2x great grandmother (Jane Elizabeth Oldroyd)’s brother John Oldroyd. SINGULAR CHARGE OF ABDUCTION. – Joshua Oldroyd was charged with the abduction of Sarah Bloward, at Tin Pot, on the Bremer, on November 15, 1857. John Oldroyd, the prisoner’s brother, stated that he was a farmer, at the Tin Pot, and knew the girl Bloward who, with her mother, lived with witness, the latter being addicted to drinking; and on a recent occasion, on witness’s return home, he found her drunk; also, that she had illused the girl, who was just thirteen years of age. On a previous occasion when a similar occurrence had taken place the prisoner was present, and, taking advantage of the mother’s bad conduct, enticed the girl away to his house, he being a single man living a short way off. That was in October. About a fortnight ago witness saw the prisoner, the girl, and her mother at prisoner’s house; then they all appeared to be living together. Witness understood prisoner had sent the girl to Melbourne ten days ago. Mary Ann Minnes said her husband formerly kept the Young Queen public-house, Freeman-street, and that she remembered the prisoner, and a little girl, who he represented as his sister, being in the house some time in November last, and staying there all night. The prisoner endeavoured to make the child drink spirits. Witness had not seen her since. 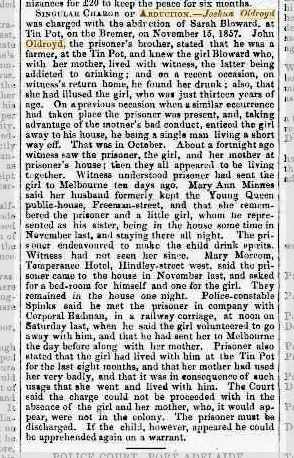 Mary Morcom, Temperance Hotel, Hindley-street west, said the prisoner came to the house in November last, and asked for a bed-room for himself and one for the girl. They remained in the house one night. Police-constable Spinks said he met the prisoner in company with Corporal Badman, in a railway carriage, at noon on Saturday last, when he said the girl volunteered to go away with him, and that he had sent her to Melbourne the day before along with her mother. Prisoner also stated that the girl had lived with him at the Tin Pot for the last eight months, and that her mother had used her very badly, and that it was in consequence of such usage that she went and lived with him. The court said the charge could not be proceeded with in the absence of the girl and her mother, who, it could appear, were not in the colony. The prisoner must be discharged. If the child, however, appeared he could be apprehended again on a warrant. Sometime between 1857 and 1875, John had moved to Woodstock on Loddon in Victoria, as his daughter Hannah was married at his residence there in 1875. In 1890, when daughter Elizabeth was married, John was living at 182 Cambridgeshire Street, Collingwood. 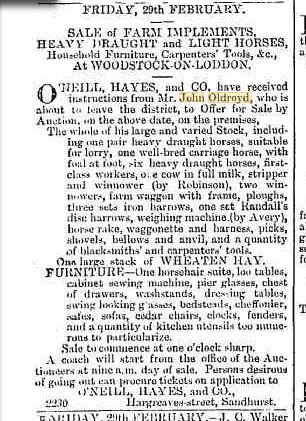 I found the following article where he was having a sale in preparation for the move from Woodstock on London, to Collingwood. The whole of his large and varied Stock, including one pair heavy draught horses, suitable for lorry, one well-bread carriage horse, with foal at foot, six heavy draught horses, first-class workers, one cow in full milk, stripper and winnower (by Robinson), two winnodwers, farm wagon with frame, ploughs, three sets iron harrows, one set Randall’s disc harrows, weighing machine (by Avery), horse rake, waggonette and harness, picks, shovels, bellows and anvil, and a quantity of blacksmiths’ and carpenters’ tools. One large stack of WHEATEN HAY. FURNITURE.-One horsehair suite, loo tablets, cabinet sewing machine, pier glasses, chest of drawers, washstands, dressing tables, swing looking glasses, bedsteads, chiffonier, safes, sofas, cedar chairs, clocks, fenders, and a quantity of kitchen utensils too numerous to particularize. Sale to commence at one o’clock sharp. 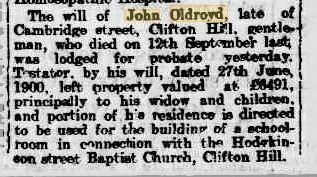 The will of John Oldroyd, late of Cambridge street, Clifton Hill, gentleman, who died on 12th September last, was lodged for probate yesterday. Testator, by his will, dated 27th June, 1900, left property valued at £6491, principally to his widow and children, and portion of his residence is directed to be used for the building of a school-room in connection with the Hodgkinson street Baptist Church, Clifton Hill. Since Jemima was also born in the Strathalbyn district, at Tin Pot, a year after the twins Emma and Elizabeth, it would appear that she was also his daughter. However, while John and his daughters Hannah Maria* and Elizabeth moved to Victoria, Jemima remained in South Australia. I decided to check the Wills and Probate Index on the Public Record Office Victoria website, to see if John’s will was available. These were the entries for John Oldroyd who died 1905 in Collingwood. * It appears that Hannah Maria is the same person as the Sarah Oldroyd born in 1855 – Hannah’s marriage certificate (she was married in 1875) states she was 20 years old and born in Adelaide.